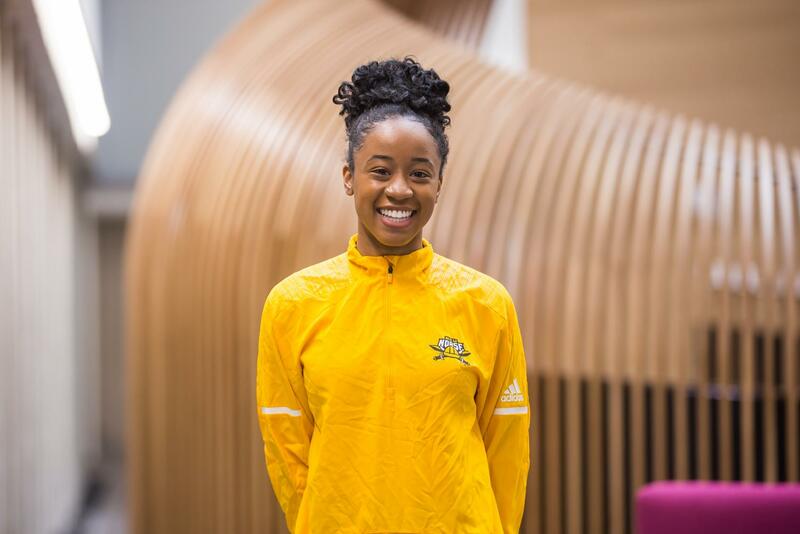 BriAuna Keys is a sprinter for NKU women’s track and field team. The senior accounting and business information systems double major aspires to be a certified public accountant for a public accounting firm. Keys’ senior season will mark her 10th year of running track. She had a hand in short distance running when she first started, but later found her niche running the 4×400 relay. Keys mentioned that she later found out that her team may have been embellishing a bit to give her the boost of confidence she needed to run. “Turns out like two years ago, I went to a grad party and they were like, ‘You know we lied to you right? Like you didn’t really run a good time, we were just trying to get your confidence,’” Keys said. “And I was like, ‘What? Why would you lie to me?’ Because if I sucked, I would have never have ran it at all, ever. Keys said she never actually saw herself running track at the collegiate level; at the time, NKU wasn’t even at the top of her list. With her coaches encouragement and help and a few official visits, Keys made the decision to run track at NKU. Outside of track, Keys keeps herself involved on campus. She holds the financial chair in Nu Upsilon’s Black Womens’ Honorary, an NKU R.O.C.K.S. mentor, a plus tutor for accounting, a REAL Choices Ambassador and a peer mentor for the Supported Higher Education Program (SHEP). Keys has also had the opportunity to attend the 2017 NCAA Leadership Forum in Washington, D. C. The NCAA picks two people out of each Division I conference across the country to discuss ways the athletes can improve their campus, sports, schools, and the NCAA overall. Keys said because of that opportunity, she has made some strong connections with student athletes across the nation. “We still to this day have a group message. We’re still helping each other with problems that we have on campus or within our sports and [we talk about] what other schools are doing to resolve that, which is cool,” Keys said. Having a “love for history” and being “studious” are two qualities Keys would say she possesses. In light of Black History Month, she said she feels as if she’s learning more and more each day. Keys said she found there are everyday tools and resources that Black people have created that people aren’t aware of, and that this month is important in showcasing that.